On the whole, the bat serves the needs of the single piece composite BBCOR realm. Although not changed at all from the 2017 version, the Resurrection of this bat via Easton, after the collapse of Combat, is a marked sign as to the general consumer love of this big b… Jump to the full review. We aren’t the only ones to have information about the Maxum. Other places, in particular those who sell bats, usually have a boiler plate write up on the specs of a bat. Many of those we reference to make sure we are seeing what we should be. Here are some more references for the 2018 Combat Maxum review. On the whole, the bat serves the needs of the single piece composite BBCOR realm. Although not changed at all from the 2017 version, the Resurrection of this bat via Easton, after the collapse of Combat, is a marked sign as to the general consumer love of this big barreled bat. As a general rule, hitters who like single piece bats prefer honest feedback from their bat. In other words, they do not like the smooth smash of two piece bats on mishits. Instead, they don’t want pop outs to left field to feel like dingers. Also, single piece bat lovers also subscribe to the idea that they can transfer more power to the ball. This makes intuitive sense as bats with two piece connections and, therefore, some give at contact won’t transfer the same amount of power to the ball as a stiff single piece bat with no give. It follows that elite hitters tend to use single piece bats. In fact, at the collegiate level, stronger hitters tend to use single piece aluminum bats. Combat throws a bit of a twist on this single piece notion by making a bat that is entirely composite. This allows for a massive barrel. And by massive we mean industry leading massiveness. With that in mind, the ideal candidate for a Combat Maxum is a player who likes honest feedback from their bat and also wants that bat to be made from Composite (and its accompanying work in) then the traditional aluminum. The fact the MAXUM has a massive barrel is a marked benefit. Aside from the paint job, there are no differences between the 2018 and 2017 Combat MAXUM. After the bankruptcy of Combat's parent company, most thought we would never see a Combat bat again. However, Easton, who is owned by that same parent company but survived the proceedings, picked up the Combat Maxum and reproduced it for this year. Combat, a Canadian based company, is known in the baseball space for a high-performance one-piece composite baseball bat with a lot of barrel. There are very few single piece full composite bats in the baseball space. 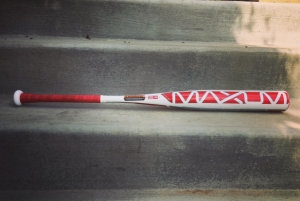 The other most popular single piece composite is a Louisville Slugger Catalyst. However, that bat does not come in a BBCOR. Most would argue the MAXUM is in a different category than the Catalyst. The Catalyst, although made of full single piece of composite, does not have nearly the same barrel size as the MAXUM. the 2019 Combat Maxum is a single piece composite bat built with a huge barrel and a moderate swing weight. Expect a huge smash if you can barrel one up. Also, over the years, they have proved some excellent durability too.